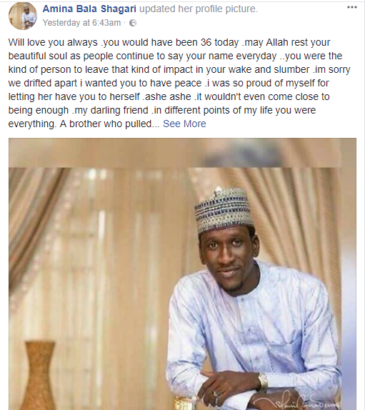 Amina Bala Shagari, the first and divorced wife of Bilyaminu Bello, who was murdered by his wife Maryam Sanda, has reacted to the news of his death. “Will love you always .you would have been 36 today .may Allah rest your beautiful soul as people continue to say your name everyday ..you were the kind of person to leave that kind of impact in your wake and slumber .im sorry we drifted apart i wanted you to have peace .i was so proud of myself for letting her have you to herself .ashe ashe .it wouldn’t even come close to being enough .my darling friend .in different points of my life you were everything. A brother who pulled my scarf when i did wrong .a friend who knew me best .we decided to get married out of pure friendship .how strong was that bond.and when we couldn’t we still found our way back to being friends.my darling.i dont have enough words .you once asked “what would u do if i die?” I promptly started crying and abused u for suggesting u would die and id be around.those tears shocked u .well if u could see me now .. the thing that was most endearing to me that probably meant nothing to you was the way you never ever ever allowed me to cross the road without holding my wrist to do it for me.it used to infuriate me before i came to expect it .id be like ” see this guy ,before him didnt i cross the road . ?” (Smiles).even when we fought u held on .